My auntie is a wonderful artist; she often travels to Italy to paint (because it’s impossible to not be inspired by such a gorgeous country), which means she has plenty of opportunities to find some real hidden gems. When I told her we’d be visiting Florence again, she told me I had to go to S.Forno. She was right. The space has been a forno (bakery) for over 100 years. For the past 40 years, baker Angelo has walked into the store every morning to prepare freshly baked bread for the local Florentines. But something happened lately. After years of 7-day weeks and 18-hour days Angelo needed time beyond the bakery business and local restaurant team behind the successful Il Santo Bevitore came to the rescue. Partnering with Angelo, they have brought the business, but kept the baker, to ensure its place in the neighbourhood is secure for the future. The daily offerings were written up on a chalkboard behind the counter, and assorted baskets were filled with loaves of bread. 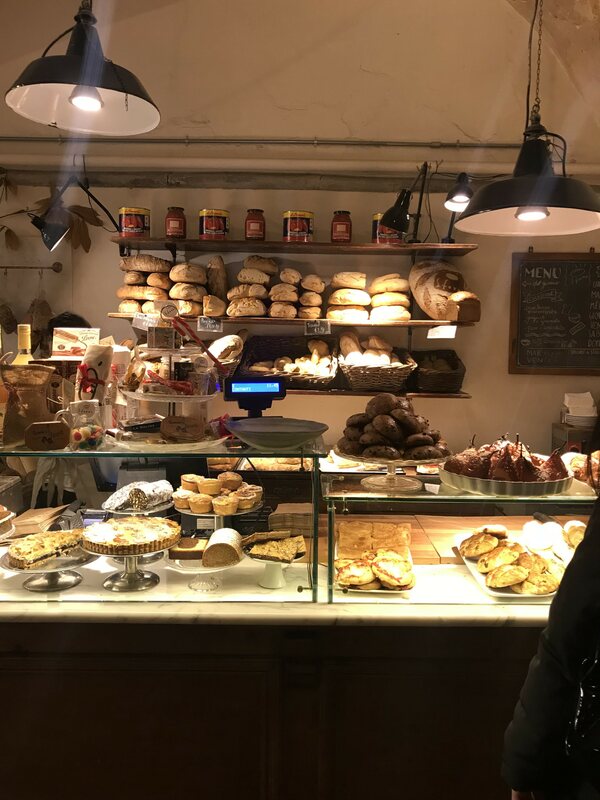 The front counter’s display case was filled with a mixed bunch of cake trays topped with an assortment of sweet treats, and the air smelt like freshly baked bread. Heaven. Husband and I were told the food was delicious and it didn’t disappoint; we ate cauliflower quiche and a prosciutto-topped slice of foccacia for lunch, and they were divine. While we ate, we watched customer after customer come through the door and leave with arms full of fresh bread. We weren’t ready to leave after lunch; the atmosohere and people watching was too good. Sitting in there felt like total immersion in Florentine life, and we couldn’t have been happier to be sitting in the middle of it. Also, the sweets looked too good to leave without sampling. Just to be clear, this is not a coffee shop. There’s no fancy espresso machine or 2 page caffeine menu. The focus is on the dough. 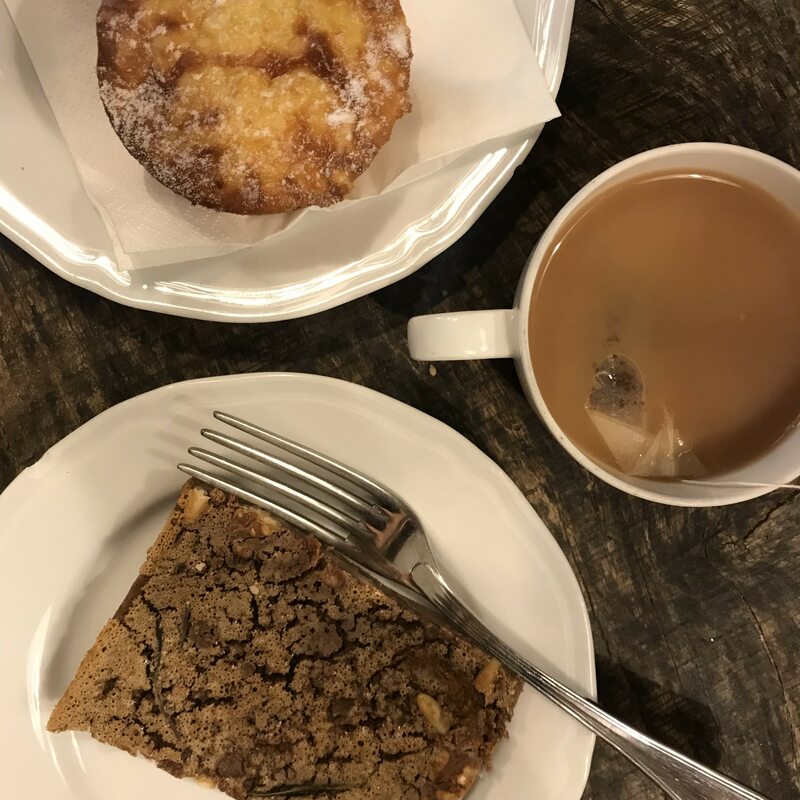 But they are kind enough to offer some self-service, stock-standard American coffee and boiling water for tea, so we grabbed some of that and chose two typically Tuscan desserts – a baked rice cake, and a piece of castagnaccio, made from chestnut flour, rosemary, pine nuts and raisins. Don’t be fooled by the nondesctipt façade; the service and atmosohere are both so warm and welcoming, and the food is some of the best in the city. 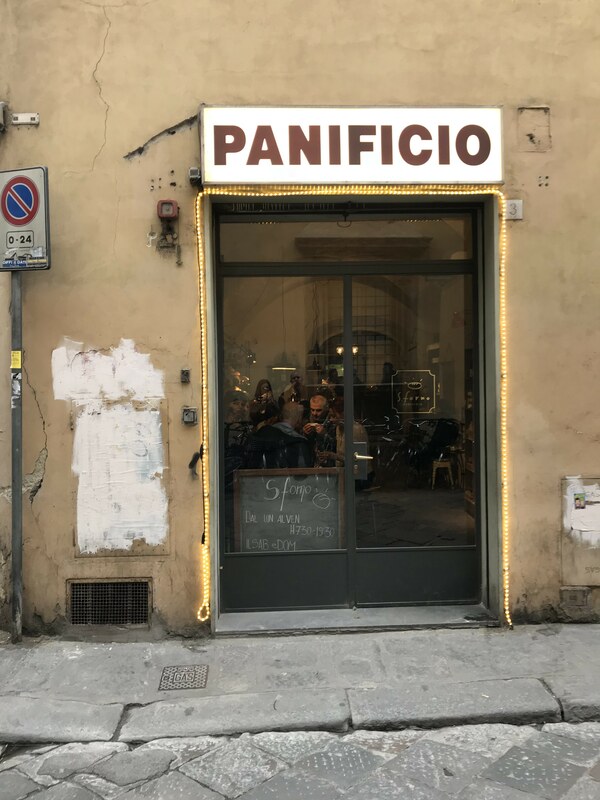 It seems that they’ve arrived at the perfect balance between old traditon and new innovation, and that should earn them a visit when you’re next in Florence! What a fun experience. Hole in the wall places can be some of the very best. I’m intrigued by the castagnaccio! 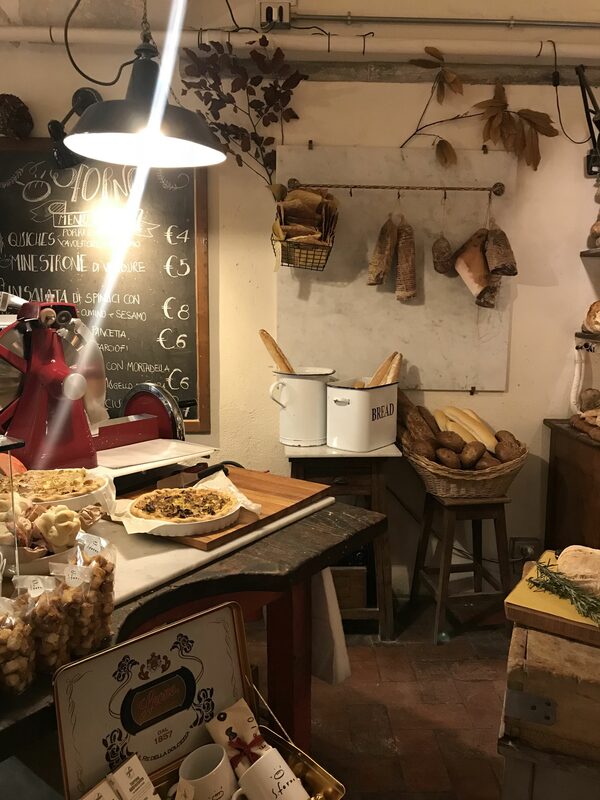 It wasn’t until I visited Florence for the first time, around Christmas, that I started noticing chestnut flavors and chestnut flour everywhere. Chestnut gelato, roasted chestnuts, and I had the best chestnut pancakes with honey and ricotta. Yum. Ohhh chestnut pancakes with ricotta sound divine!!! The smell of the roasted chestnuts over there in winter time is amazing, hope you enjoyed trying them all! It sure was – so happy my auntie remembered to tell me about it!